Maybe it’s because I’m a goal setter, but I really enjoy setting budgets and I think budgets can be incredibly helpful. Whether you’re starting a family budget or maybe an emergency fund, a budget can be a great way to get a visual look at your finances. So why not create a get out of debt budget if you’re struggling with that area of your life? I think that this can be a really great tool for realistically managing and eventually eliminating your debts. How do you create a get out of debt budget? Well, you’ll start like you would with any budget. Start by factoring in your current debts. * The percentage rate you’re being charged. Add up everything – including credit cards, money you owe to family or friends, medical bills, tuition, etc. Don’t let yourself guess at these numbers – either look at your current statement or better yet, call for a current balance in case you’ve charged more since the last one was mailed out. Then you want to consider other expenses in your life like bills. This way you’ll have a good idea of how much money you’re needing to save in order to stay within your budget. Next you need to decide how you’re going to start paying off your debt. You could start with your highest interest rate credit card or you could start with your biggest debt. Whatever the case may be, figure out how you’re going to start and make a list from there. Next, you’ll figure out where your money is coming from. Include all of your resources- salary, child support or alimony, etc. Once you have that figured out, subtract your monthly expenses (cell phone, utilities, groceries, etc.) and whatever you leftover from that is what you’ll use for your debt budget. Now it’s time to set up your get out of debt budget. Or you can use a different method, whatever works for you! Just so long as you’re creating a debt budget. Maybe you want to figure out which debt can be paid off the quickest and focus on that or maybe you want to consider which debt is impacting your life the most and pay of that one first. Or maybe you want to work on each of your debts a little bit at a time until they’re all paid off. As with any budget, you may need to experiment before you find a method that works for you. The point is to find a system that works that will realistically get you out of debt. You can use my easy financial tracking tool to get started. 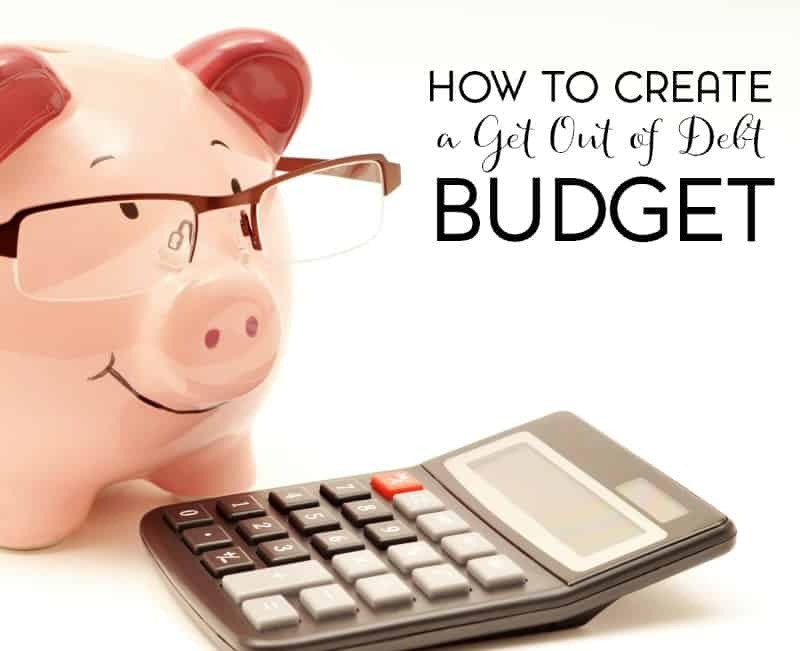 Have you created a get out of debt budget before? What steps did you take? The first step to getting out of debt for our family was to get on a budget. Since being on a budget, we have saved twice as much and paid off a bill. we are now able to buy our first house! Yay! Thanks for sharing your tips and expertise at Inspire Me Monday! I agree that it is so important to look at the interest rates you care being charged for certain credit cards or accounts… get rid of those high interest rate ones first!! Thank you for sharing on the #ShareTheWealthSunday link up!